The success of the entire food supply chain depends on the prosperity of farms and local communities. The direct climate change risks faced by the agricultural sector are therefore also risks to businesses and food supply chains. Hence the importance of resilience at farm level, community level and business level when looking at food supply chain policy and management. Climate Change Adaptation and Food Supply Chain Management highlights the issue of adaptation to climate change in food supply chains, the management and policy implications and the importance of supply chain resilience. Attention is given to each phase of the supply chain: input production, agriculture, food processing, retailing, consumption and post-consumption. European case studies demonstrate the vulnerabilities of contemporary food supply chains, the opportunities and competitive advantages related to climate change, and the trans-disciplinary challenges related to successful climate adaptation. The authors argue for a redefinition of the way food supply chains are operated, located and coordinated and propose a novel approach enhancing climate-resilient food supply chain policy and management. 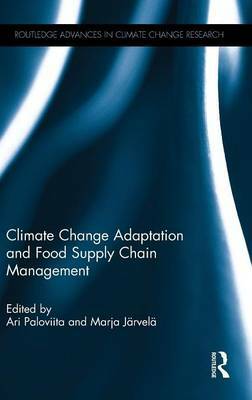 This book will be of interest to students, researchers, practitioners and policymakers in the field of climate adaptation and food supply chain management and policy.